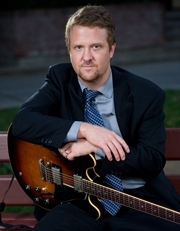 Nick Fryer is a guitarist, composer and educator. Fryer has performed throughout the United States, Canada and South America with appearances at jazz festivals that include the JVC Jazz Festival NYC, Iowa City Jazz Festival and Jazz in Peru International Jazz Festival. Fryer has had the great privilege to share the stage with many jazz greats including Peter Erskine, Anthony Cox, Mike Clark, Red Holloway, Dennis Mackrel, Rufus Reid, Billy Hart, David Bixler, Bob Mintzer, Pete McCann, George Schuller and Ed Schuller. Fryer received a B.M. in Jazz Performance from CCM and a M.M. in Jazz Performance/Pedagogy from Northern Illinois University. Studies also include New York University and the School for Improvised Music in New York City. Fryer has studied privately with Steve Cardenas, Brad Shepik, Pete McCann, Bruce Arnold, Fareed Haque, Randy Vincent, John Hart and Tony Moreno. Fryer has over 20 years of teaching and arts administration experience and is currently on faculty at CCM and Northern Kentucky University. Prior to this, Fryer was the Associate Director of the Brubeck Institute in Stockton, California, and before that was an Associate Professor of Music at Minnesota State University Moorhead where he coordinated the guitar program and directed jazz combos, taught jazz history and directed the jazz guitar ensemble. Fryer also previously taught at Harold Washington College and the Chicago Academy for the Arts in Chicago. A D’Addario Performing Artist, Fryer performs and presents clinics at colleges and high schools throughout the United States.